The star known as (deep breath) SDSS J102915+172927, in the constellation Leo, isn't much to look at. It's a bit smaller than the sun and a bit hotter  but then, the same can be said for millions of other stars in the Milky Way. If not for a detailed census of the universe carried out over the past decade or so by the automated Sloan Digital Sky Survey (the SDSS in the star's name), astronomers would probably never have noticed it. But Sloan's powerful software, which processes images gathered by a telescope at the Apache Point Observatory in New Mexico, flagged the star as potentially interesting despite its seeming ordinariness. The tip-off was its spectrum, the rainbow of colors that appears when starlight is smeared out in an instrument called a spectrograph. Like all spectrums, this one was striped by dark lines caused by light-absorbing elements in the star's outer layers. When a team of European astronomers found the star in the massive Sloan database, however, they realized that the pattern of lines, and thus the mix of elements, was very different from the sun's. And when they used the powerful Very Large Telescope in Chile to take a closer look, they discovered just how unusual SDSS J102915+172927 is. For one thing, it's almost certainly one of the oldest stars in the cosmos. The sun has been around for about 4½ billion years, but this star has been glowing for about 13 billion. Ancient stars are inevitably worth studying because they provide a glimpse into a time when the universe was young and still forming, and this one, says Elisabetta Caffau, of the Center for Astronomy at the University of Heidelberg and the Paris Observatory and the lead author of a study in the latest issue of Nature, "was formed very shortly after the Big Bang." 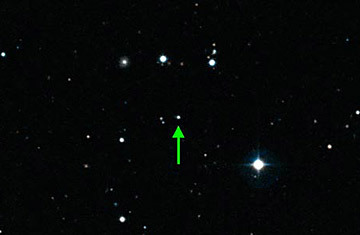 More to the point is the startling fact that, according to conventional star-formation theory, the object people are now calling "Caffau's star" shouldn't exist at all. It's very deficient in two elements  carbon and iron  that many theorists believe are critical components for normal stars to form. It's also deficient in lithium, which is not essential for a star to take shape but ought to be present all the same. Wonders Caffau's co-author Hans-Gunter Ludwig, also at Heidelberg and Paris: "Where has [the lithium] gone? To understand the mystery, you need just a little star science. The Big Bang created the first elements in the universe: lots of hydrogen, some helium and the tiniest soupçon of lithium. The very earliest stars  very massive, very hot and very fast to burn  were made of just these ingredients, nothing more. At the cores of these hot giants, nuclear reactions forged those three primordial elements into heavier ones, including carbon, oxygen and iron. When the giants exploded as supernovas, they spread the heavier elements out into the universe, where they were recycled into the second generation of stars  still mostly hydrogen and helium and a bit of lithium but with a smattering of the new elements as well. Caffau's should presumably be part of this second generation. Here's the catch: when clouds of interstellar gas collapse to form more-modern, sunlike stars, the gas heats because it's being compressed. If the heat can't be shed somehow, the compression can't proceed all the way to star formation. Theorists had been convinced that atoms of carbon and oxygen would do this job, since they radiate heat efficiently. And in fact, the three oldest sunlike stars yet discovered had reasonable amounts of both substances. Not Caffau's star, though. It's got hydrogen and helium to spare  but none of the carbon or oxygen that would have let its ancestral gas cloud shed heat and make a star in the first place. Something is clearly wrong, but since the star undeniably exists, it's pretty obvious that what's wrong is the theory. "I'm an observer," says John Norris of the Australian National University, who wrote a commentary in Nature on the new discovery. "I go out and measure things. It doesn't bother me if it goes against existing theories. It's the theorists' job to explain what I see." He admits that he finds the lack of lithium in Caffau's star "really puzzling" and has no clear explanation for it, but he does have thoughts about the carbon-oxygen problem. "We now have two categories of these very early stars, one with carbon and oxygen, the other without." The first category, he points out, includes just three examples known to science. The second has one. That's an awfully meager basis for deciding which sort of star is normal and which is the oddball  and maybe neither one is. "The way I look at it," he says, "nature may have more than one way of skinning a cat." Skinning a cat, in this case, means at least two different recipes for making stars  just the latest surprise from a crucial time in the history of the cosmos, and the latest argument for studying the era further. "We need more data so we can get more insight into what was happening in the first few hundred million years after the Big Bang," says Norris. A reasonable thought, especially since all of known cosmic history flowed from that critical time. See 10 things you didn't know about the moon.